The 2012-2013 CEESA Blue Division Champions! 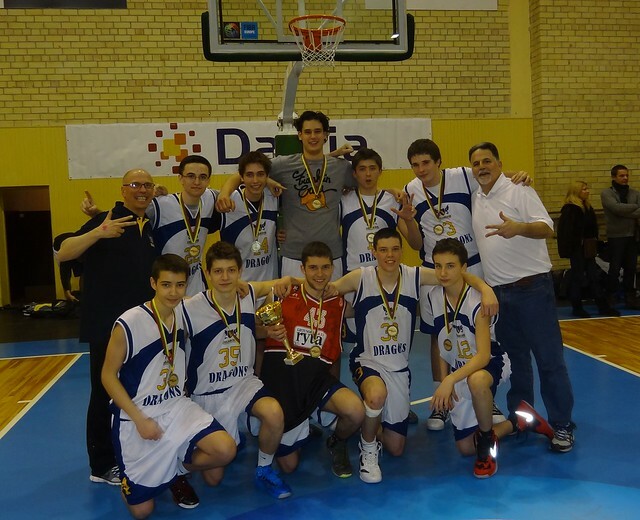 For the second consecutive year, the International School of Belgrade Boys’ High School Basketball Team are the Central and Eastern European Schools Association (CEESA) Blue Division Champions. They defeated the host school, the American International School of Vilnius, Lithuania in the finals, 43-39. The Dragons finished 7-0 over the three-day tourney and repeated as champions, also defeating Vilnius in the finals of last year’s tourney, 60-55. The Dragons cruised through the round-robin competition, winning by an average margin of 21 points. Their toughest match in the seven-team round-robin was with AISV, where they came from behind in the first game with AISV to win 49-44. The championship Most Valuable Player was senior captain Carl Kelly. Carl scored 76 points during the tourney and made many clutch steals, rebounds, and baskets when the Dragons needed them the most. Freshman Brin Mrzel was the second highest scorer with 58 points, many coming from behind the 3-point arc. ISB had the most talent of any team in the tourney and it showed with the depth of scoring. Serbian seniors Luka Gobeljic and Dimitrije Veselinovic combined for 94 points and 78 rebounds in the tourney. Brothers Sava and Sima Stakic played amazingly together, combining for 30 steals, 15 each, in the seven games. Two other seniors finished their ISB careers in style, with Matija Tausan and Simon Simsic scoring a combined 39 points and grabbing 53 rebounds. Junior guard Travis Eller played exceptional defense and senior forward, Alexander Soljakovski played valuable minutes, giving the starters the rest needed to win in the final game. This was the most successful HS boys’ basketball team in school history. The Dragons finished with 17 wins and 2 losses. They defeated teams from 10 different countries and scored 178 more points than the opposition, that is an average of almost 10 more points a game than their opponents. 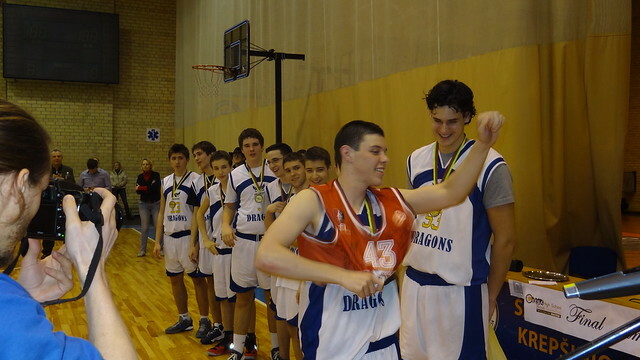 In tournaments leading up to CEESA, the Dragons also defeated three “Red Division” schools, Budapest, Bucharest, and Vienna. The Red Division teams are the larger schools, with enrollments above 500 students, in CEESA. The championship marks the second consecutive first place finish and the third in four years. The Dragons lost in the finals in 2011 to Zagreb 54-57. Carl Kelly was on all three of the championship teams! The Dragon coaches, (Jeff Eller and Bill Kralovec) would like to thank Athletic Director Damian Hart for his relentless efforts in making the program the best in CEESA. Thanks also to the staff at the American International School of Vilnius, especially Activities Coordinator, Jolita Norkunaite, for a first-class hosting job. The care and attention to details made a big difference and this was the best CEESA tourney we ever attended! We also want to thank the parents, teachers, and ISB staff for their support for the team during the entire season. Coaching the team this season solidified my belief that sports in schools enhances a students education and does not detract from it. Also, the school taking a lead role in developing and implementing a sports program is much better than by a private club. The teacher-coach can be an incredibly strong mentor for young men and women. The lessons learned in a season will go far beyond high school. The student-athletes will take away skills (collaboration, finding one’s role, commitment, resilience, concentration, etc) and fond memories of these CEESA championships. The tears, hugs, and shouts of joy of the players at the end of yesterday are signs that sports are so vital in schools. Congratulations to the “most successful HS boys’ basketball team in school history”, and their coaches, Mr. Kralovec and Mr. Eller. It was so exciting watching the games through the live stream. Thank you for writing this article.